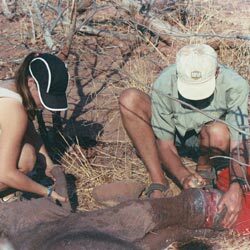 The Victoria Falls Wildlife Trust offers internships to people interested in wildlife conservation with experience in animal handling, ecology, zoology, veterinary and pre-veterinary disciplines, agriculture, laboratory diagnostics, and a range of other fields. Interns will have the opportunity to be based at the VFWT laboratory and clinic facility situated in Victoria Falls National Park, on the Wild Horizons concession. This facility is about 15 minutes from the town of Victoria Falls in a wild area below the Falls themselves. We suggest interns apply for a slot in a five week intake. This is mutually beneficial to the project and the intern in that it allows enough time for getting involved in a project and accomplishing work on the ground as well as providing the intern with valuable experience. All projects have both field work as well as office work involved in entering data collected from the field or following up on research information. We are now offering volunteers an opportunity to be a part of our conservation efforts by participating with our interns. Anyone over the age of 18 is encouraged to apply to become a Victoria Falls Wildlife Trust intern. Depending on the time of year, age, experience and interest, various projects are available to each individual. 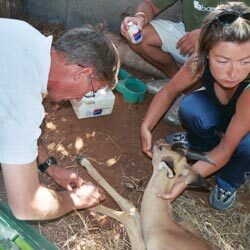 Rescue and rehabilitation of Wildlife- we taken in wildlife that has been injured through human interference, this project is dependent on if any wildlife has come into the facilities. It is not a full time project and clinical work is rather limited, but interns are responsible for the daily feeding and monitoring of any rescue and rehab cases that come in. This includes mammals, birds of all types, the odd reptile and some small primates. Predator Conservation project- VFWT works together with Oxford WildCru Hwange Lion Research to understand the regional population dynamics of lions and other large carnivores. This project involves monitoring lions that have already been collared, following up on the spatial data to get visual sightings of the cats, evaluate kill sites, conduct spoor transects and change collars on the cats when they are failing. Vegetation survey on impact of wildlife. Transects have already been set up and measured. We need assistance with the quarterly photography, research and entry of the information found, including everything of plant species to rainfall measurements. Human-Wildlife Conflict is a major problem for the communities that border wildlife areas. VFWT has been conducting research on conflicts for more than 3 years. This project entails monitoring our conflict hotline, and responding to every conflict incident to evaluate the incident, and to work with local communities to put mitigation solutions in place to try and prevent future conflicts. Wildlife Disease Sampling and basic analysis. Every animal that we dart or treat we take a range of samples from. Get involved in processing of the samples as well as a basic analysis of some of the samples at our Wildlife Laboratory and Clinic. If you are a pre-vet or veterinary student this is a good project for looking at zoonotic and transboundary animal diseases. PhD and Graduate Students or Researchers, needing a base and facility in which to be accommodated and to conduct their studies and have logistical support, this program is designed to assist you, please enquire especially if you are a veterinary student. Darting of wildlife is opportunistic and mainly during the dry season in which VFWT staff are called on to assist in immobilizing wildlife to take off wire snares or treat wildlife that has been harmed due to human interference. 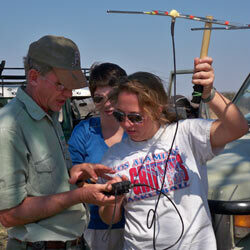 Cattle Sampling is a key project for VFWT. We work throughout the region to test cattle for diseases that are often transferable between wildlife and livestock. Travel with the veterinary disease surveillance team around the country to test cattle for bovine tuberculosis, brucellosis and foot and mouth disease. Vaccination Programs are conducted annually in conjunction with Vets for Animal Welfare Zimbabwe (VAWZ). Get involved in providing rabies and canine/feline vaccinations to the community in and around Victoria Falls. For 2014 the program is set to run in July. Help us prevent disease transmission between domestic pets and wildlife. VETS GO WILD is a program that is run for vets and pre-veterinary students aspiring to have more experience with wildlife. VFWT assist VETS GO WILD in offering our experience and training as part of this course. For more information on this program please click here for the brochure. You will be accommodated with other interns at a local Bed and Breakfast in the town of Victoria Falls. Ablutions facilities are available with flush toilets and hot and cold running water. Simple meals will be provided from the facility's kitchen. A staff member will take care of laundry. Internet access is available at any of the Internet Cafe's in the town or at the Victoria Falls Wildlife Trust Laboratory. 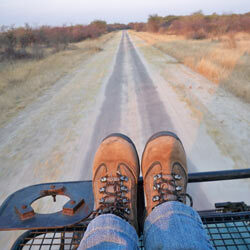 There is available transport to and from Victoria Falls twice a day, once in the morning and once in the afternoon. Your hosts will be Wildlife Veterinarian Dr. Chris Foggin and Roger Parry, Managers of the Victoria Falls Wildlife Trust. They have a fabulous team of guides and staff that you will be working together with. We take up to six students per intake, in the months of May through September we specifically reserve 4 slots for veterinary and pre-veterinary students. So book early! The current costs are as follows: Intern $650 per week. Volunteer $750 per week. Costs include all accommodation, meals, and transportation to the individual’s project (to and from Victoria Falls Town). Please note costs are subject to change. *An additional charge of $92 per day will be charged for any additional days booked to stay on before or after the internship at the B&B.